Background: The renin angiotensin system (RAS) plays an important role in inflammation and fibrosis. The classical axis of the RAS, formed by angiotensin converting en-zyme (ACE), angiotensin II (Ang II) and angiotensin receptor type 1 (AT1), activates several cell functions and molecular signaling pathways related to tissue injury, inflammation and fibrosis. 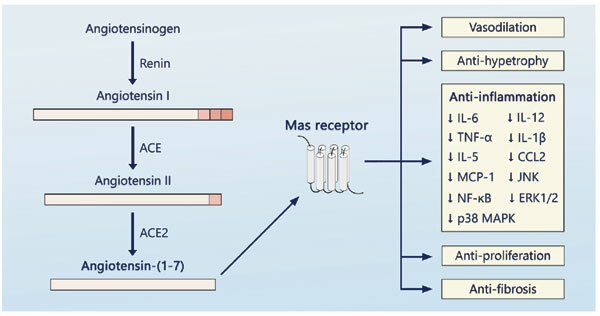 In sharp contrast, the RAS axis composed by angiotensin converting enzyme 2 (ACE2), angiotensin-(1-7) and Mas receptor exerts opposite effects in relation to inflammatory response and tissue fibrosis. Objective: In this review, we have the aim to summarize recent findings on the anti-inflammatory and anti-fibrogenic role of ACE2/Ang-(1-7)/Mas axis in the context of basic research, experimental human dis-eases and clinical studies. Results: Several studies showed that ACE2/Angiotensin-(1-7)/Mas axis reduces cytokine release and inhibits signaling pathways of tissue fibrosis in experimental models of human diseases including atherosclerosis, cerebral ischemia, obesity, chronic kidney disease, liver diseases and asthma. On the other hand, very few data was provided by clinical studies. Conclusion: Experimental studies clearly support the anti-inflammatory and anti-fibrotic effects of ACE2/ Ang-(1-7)/Mas axis. Clinical studies, especially phase III and IV trials, will be necessary to establish the therapeutic role of ACE2/Ang-(1-7)/Mas axis in controlling inflammation in different human diseases. Angiotensin-(1-7), Mas, ACE2, angiotensin II, inflammation, cytokine, leukocyte, fibrosis.